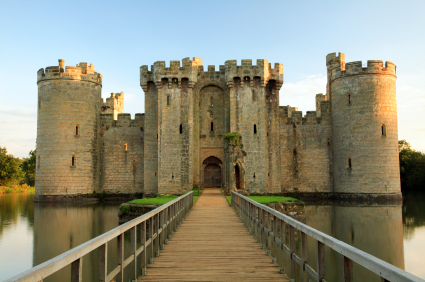 Bodiam castle looks exactly like the popular image of a medieval castle. It's quadrangular in shape and has a tower on each end of the wall. Being surrounded by a moat, Bodiam castle appeared totally unassailable, though it was built mostly to dissuade attackers rather than to actually withstand a siege. Most walls are just a few feet thick, so an attack would have devastated the castle. The castle contains two gatehouses: one in the northern end and another in the southern end of the castle. They both have a complex drawbridge that was lifted during the night and difficult times. The castle was built during the Hundred Years War between France and England. Since it's located in the south coast of England, the English were expecting an invasion, one that never occurred. Bodiam castle was never besieged. It fell into decay after the Middle Ages and its stones were even looted by local builders. It was acquired and restored by Lord Curzon. Today it's a very beautiful castle where one can walk atop most walls and enter all the towers. View another picture.